Javier Rivera-Carbone is an employment law litigator and labor relations consultant. After a decade of large law-firm experience, he created his own firm focused on employment litigation, labor relations and workplace investigations. Javier represents employees and select employers in labor and employment law matters before administrative agencies, federal courts and the Courts of California and Puerto Rico. He has an excellent record of achieving positive result for clients, and he is fully-bilingual (English/Spanish). Javier mainly represents employees but he is also dedicated to workplace fairness. For that reason, he gives advice and trains good employers to comply with federal and state employment laws, rules and regulations. Javier also conducts neutral independent investigations into employment-related disputes or confidential matters. Javier has experience in all aspects of workplace law litigation, including discrimination, retaliation, wrongful termination, sexual harassment and wage and hour cases. He has provided labor relations advice, including the negotiation of collective bargaining agreements, strike management and the litigation of arbitration cases and charges of unfair labor practices. Javier has also handled administrative law matters before agencies such as the U.S. Department of Labor, the U.S. Department of Justice, the Department of Homeland Security, the U.S. Department of State, the California Department of Industrial Relations, and the Department of Fair Employment and Housing, among others. 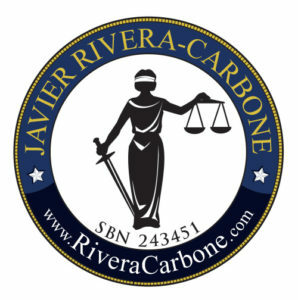 Please note: Communicating with us will not make you a client of the Rivera Carbone PC. Do not send us any unsolicited confidential or sensitive information.